Progress on Hesston College’s campus construction projects recently extended to Yost Center. With basketball season still underway, the latest developments affect how Lark fans and guests enter the building for basketball games. On Feb. 1, crews began work at the spot of the new west entrance of Yost Center. Construction fences went up, making the entrances on the northwest and southwest sides of the building – those nearest the parking lot – inaccessible for the remainder of the school year. The front rows of the parking lot will also be inaccessible during construction. Guests who park in the Yost Center parking lot off of South College Drive, will enter the building at the east campus-side entrance. For home basketball games, a golf cart will be available to transport guests needing the service from the parking lot to the east entrance. The service will be available for about 30 minutes prior to the start of both women’s and men’s games, and at the conclusion of the final game. Sidewalk access on both the north and south sides of the building will be open for guests to walk or be transported to the east entrance. 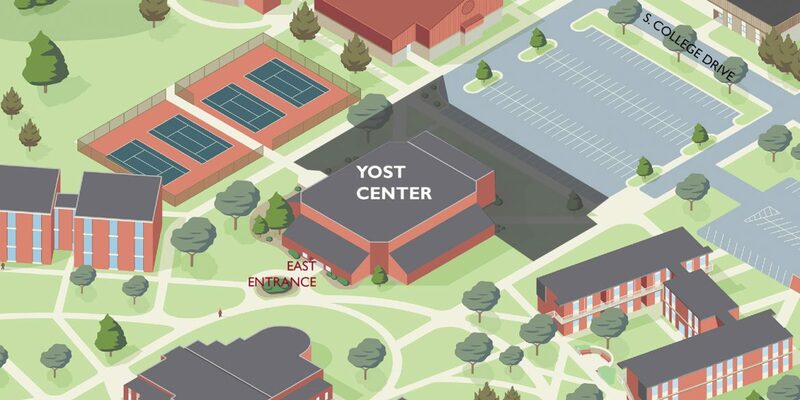 The $3 million construction project on Yost Center will result in the addition of a west campus entrance and a weight room, a refurbishing of the gymnasium, new office space for coaches and administrative staff, a team room and more.